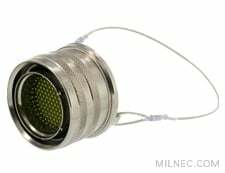 The MIL-DTL-38999 Series I style lanyard release plug is designed for military applications and can replace the MS27661. The lanyard release functionality makes disconnect quick and easy. The plug is compatible with 38999 Series I receptacles. Protective covers are recommended when the connector is not in use.